In this area of big box shopping and mass consumerism, many crave the simpler virtues that seem to be eroded more and more over time. Your passion is music and music is most definitely not a mass produced, cookie cutter affair! 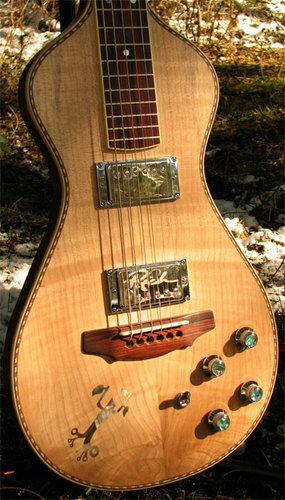 My passion is handbuilt instruments. If you are in the market for a fine new guitar please consider having it made with love and care by a real person rather than a corporation. In return you will receive more than a new toy, youâ��ll build a new relationship with yourself, your music and your community. Your instrument will reflect your values and altogether be a much more personal item. I make many styles of instruments all of which reflect my goals of ultimate quality and dedication to sound. These include everything from Classical guitars to Electric Lap slide guitars. 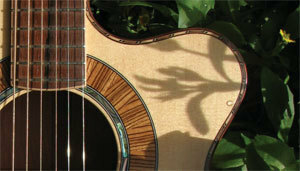 I also build ukuleles and tenor guitars, so as you can see there's lots for everyone! 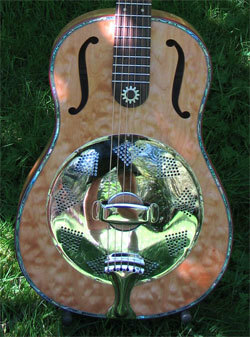 Here is a picture of a curly maple biscuit bridge resonator made for local athlete Sam Whittingham. My work progresses at all times. Currently I am building a new unique model and trying to refine all my ideas and thoughts. Hide glue will be used throughout and a traditional dovetail joint for the neck is utilized. The body shape is fresh and new while hinting at days gone by. This lap steel was built for local musician Shane Philip and features and inlay by artist Dave Oram. Shane is a multi talented man and plays guitar, drum and didge all simultaneously! Very passionate and compelling music. Inlay is a specialty. In this picture is the 'Green Man' seen carved in cathedrals from the middle ages in the bottom of pews and in stonework. 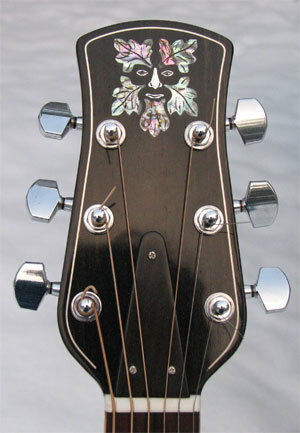 Other inlays I've done are of birds, bears, frogs and newts. Quadra Island is a beautiful and inspiring place for any artist.